The origin of the town was as a small fishing port and dates back to Phoenician times when the "Conii" tribe populated the area. Due to the topographical flatness of the area the neighbouring hill of Castro Marim lent itself to a stronger location to fortify. 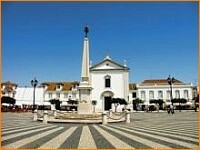 This frontier town with Spain was especially designed and rebuilt after the terrible earthquake of 1755 by the Marquês de Pombal, an very influential Royal Minister in the 18th Century who redesigned the centre of the City of Lisbon due to the same earthquake. The population of approximately 14,000 inhabitants tend to gain their living either working in the tourist industry, fishing, or, trading across the river with their Spanish neighbours. Attached to the Town Hall is a small but interesting museum which is mainly focused on the designs for tins for packaging in the fishing industry. It is a very pleasant and relaxing experience to cross the river by the original ferryboats and visit the Spanish town of Ayamonte. 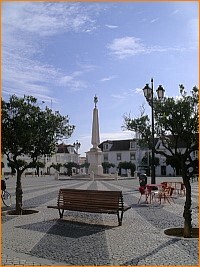 Visitors can take a boat trip upriver to the charming small unspoilt Portuguese town of Alcoutim. 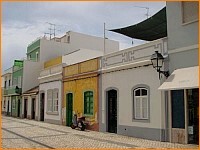 North of Vila Real de Santo António is Castro Marim that due to its location has played a considerable part in the history of Portugal. This later town was originally chosen as the founding headquarters in 1319 of the 14th Century movement of the Order of Christ. Although the buildings are now in ruins from the effects of the 1755 earthquake it still has the unusual feature of having a castle built within a castle. In the 17th Century a stronger and more defensive stronghold was built on a hilltop just to the north that also still remains. The castle acted as a well-known haven to escapees in the early days from the Spanish Religious Inquisition until the Portuguese also introduced their own Religious Inquisition. From the walls of the castles the view is to the south across the flat lands that are now a nature reserve for birds and plants and this area is known as the Reserva Natural do Sapal. Near to Vila Real de Santo António are the holiday destinations of Manta Rota, Monte Gordo and Praia Verde, all purpose built to provide accommodation for visitors to the long sandy beaches. Inland, and up river is the interior small unspoilt administrative town of Alcoutim with its ruins of two castles that date back to the Moor occupation of the Algarve, and of which one that is even older dating back at least 1000 years. The King Dinis rebuilt the main castle in 14th Century but it was liberated from Moor occupation in 1238. This small town looks across the River Guadiana at the Spanish town of Sanlúcar and has a local museum. 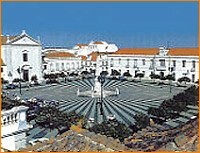 It was at this town that Dom Fernando I signed in 1371 an important Peace treaty with Don Henrique II de Castile. Even further up river is the town of Mértola with its 13th Century castle ruins. The Phoenicians founded this historic town as an inland port, later successfully used by both the Romans and Moors. Perched on a high spur overlooking the River Guadiana this town has many vestiges of the past and a museum housing one of Portugal's best collections of Islamic art. Back on the coast the small beachside village of Cacela-a-Velha dates back to Phoenician times and has an 18th Century Fort that overlooks a small natural lagoon between itself and the protecting sandbar.